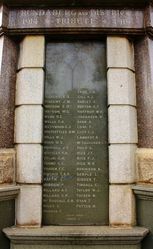 Bundaberg War Memorial pedestal bears the cut and gilded names of one local soldier who served and fell in the South Africa (Boer) War and the 277 who died in service or were killed in action in World War One. 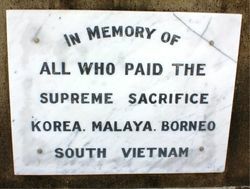 Commemorative plates for later conflicts have been added to the pedestal to commemorate those who paid the supreme sacrifice in World War Two, Korea, Malaya, Borneo & South Vietnam. 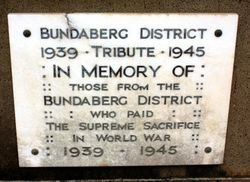 The Bundaberg War Memorial was incomplete when it was first unveiled on ANZAC Day 1921, as the statue had not arrived from Italy. 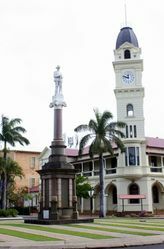 In the presence of some 5000 people on the 30th July 1921, the magnificent marble statue erected by the citizens of Bundaberg and District to fallen soldiers was unveiled by Major- General Brand. 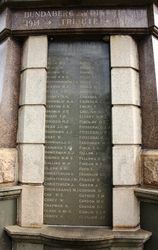 The monument which is erected in the heart of the city is 16ft high surmounted by the figure of a typical digger, 7ft.6inches high carved out of a block of solid marble and made in Italy. 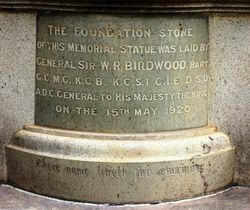 It is claimed to be the finest statue of its kind in Australia and cost £1900. 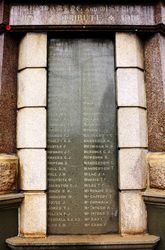 The tablets bear the names of the men who paid the supreme sacrifice. 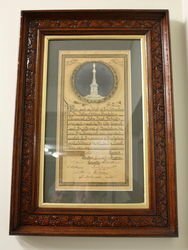 Queensland Times (Ipswich), 1st August 1921.